Festival season is quickly approaching and we here at Under The Gun are thoroughly excited about it. 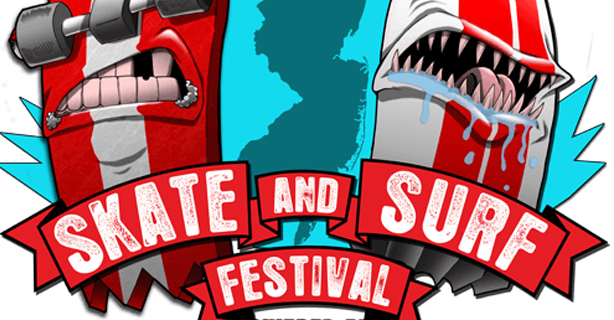 The closest festival in our sight is Skate and Surf 2014. It is once again being held in Asbury Park, NJ right on the oceanfront and we are scheduled to be bringing you some great video interviews from throughout the weekend. If you’re a nostalgic music fan in your 20s or 30s or even a 16-year-old kid, chances are the Skate and Surf Festival will be an enjoyable (and unforgettable) experience. There are plenty of bands to choose from, but you aren’t completely overwhelmed with options. This may seem like an argument that is rarely put forward, but we like that there aren’t over a hundred artists performing or an excessive amount of stages to choose between. It gives the old school fans a chance to check out the newcomers and the young kids in the crowd an opportunity to experience the classics. The UTG staff has come together to make a list of which bands we suggest you don’t skip at this year’s S&S. Check out below the jump to see what artists we chose and make sure to comment and let us know who you’re most excited to see! The lineup for each day has solid artists ranging from the 1990s up to bands formed in recent years. Regardless of distance, the prospect of seeing the reunion of Midtown or Saosin perform with Anthony Green are enough reason for many of us to make the trip out to Jersey, but with a diverse lineup like this, we’re sure it’ll be a busy weekend with more to offer than we can even plan for. For our choices on this feature, we decided to stay away from the obvious headliners; we don’t think anyone needs any convincing to go see Midtown, New Found Glory or Alkaline Trio. From the first few notes of “Bleed For You,” I’m immediately transported back in time. HIPV’s Life In Dreaming was released 9 years ago during the glory days, back when Drive-Thru Records was still a thing. Bands like The Movielife, Something Corporate, Finch, Allister, Midtown, and more played venues in New York that no longer exist. This music brings me back to when the scene was a bit different; it was thriving, hyperlocal, and there was no shortage of good bands to check out. Watch the video for “Bleed For You” from Life In Dreaming. I think Youth took most people by surprise. Maybe because we had seen this upbringing before within the scene. Big local act signed by big indie label, LP due out in spring/summer, produced by Will Yip (looking at you Daylight and Turnover). While both Magnolia and Jar are great in their own right, something about Youth captured me. Solidified by a night ending set at this past summer’s Warped Tour, Citizen resonate strong. The tracks found on Youth assert themselves as songs first, weaving layer after layer knowing that a song is only as good as its form first, and experimentation later. Watch the video for “The Summer” from Youth. Watch the video for “Give Up” from Don’t Come Home. Watch the video for “Hey Mario” from Brighter. Watch the video for “Tell Me Why” from In Currents. Watch the video for “Paralyzed__” from Divided By. Watch the video for “Collide” from Us Against Them. Watch the video for “Sharp Practice” from Violent Waves. Watch the video for “Keep Me Alive” from Descendants. They might be listed towards the bottom of the bill, but Pianos Become the Teeth are a force to be reckoned with at this year’s festival. The past two times that I’ve watched the band perform (one time co-headlining with Moving Mountains at a skatepark and the other being on their recent run with La Dispute), I’ve consistently been blown away by frontman Kyle Durfey’s ability to wring out every ounce of his emotions onstage. Listen to “Hiding” from their split with Touché Amoré.